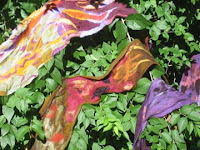 At the Princeton YWCA on April 6th, from 10 am to 3 pm we will be making silk and wool scarves. From ages 12 and up. Suitable for beginners, too. Bring a bag lunch.